Don’t let the animation fool you: Arjun: The Warrior Prince is not a movie for kids. At least it’s not a movie for young kids, unless your toddler is fond of beheadings. The title character, Arjun, is one of the heroes of the epic the Mahabharata. As in many of the stories in similarly ancient texts, such as the Bible’s Old Testament, Arjun’s story is full of graphic violence and complex gender issues. The subject matter may not be as universally appropriate as something like Cinderella, but the story certainly is interesting. The middle child in a family of five brothers, nine-year-old Arjun and his siblings return to their grandfather’s kingdom. The boys grow up alongside their cousins, training to become warriors and, possibly, kings. Duryodhana, the eldest of Arjun’s cousins and the story’s obvious villain — complete with pointy facial features and an ominous mustache — resents the presence of Arjun and his brothers and the threat they pose to his claim to the throne. When Duryodhana’s plot to murder his cousins fails, the king sends Arjun’s family to a remote palace, easing the tension but effectively dividing the kingdom in two. A guy named Krishna (Sachin Kedhekar) shows up out of nowhere to teach a now young adult Arjun (Yuddvir Bakolia) how to be a proper warrior. The fact that Krishna is a god is not made explicit in the film and will be lost on viewers unfamiliar with Hindu theology. Arjun’s newly acquired archery skills win him the hand of a princess of a neighboring kingdom, providing his family with the monetary and martial support they need to finally oppose Duryodhana. Arjun is an interesting hero, in that he is thoughtful and humble. He doesn’t act as though he is aware of his heroic destiny. Arjun is troubled when he sees his older ox of a brother, Bheem (Ashok Bhantia), beat a man to death. (The dead man isn’t shown, but Bheem’s flying fists and the resulting spurts of blood are.) Arjun isn’t sure if he can be a killer. Not knowing the story ahead of time, I expected introspective Arjun to find a way to solve his problems and save the kingdom without resorting to violence. That was before Arjun stages the most gruesome animated killing spree I’ve ever seen, beheading scores of soldiers and chopping many others in half. The climactic bloodbath doesn’t even solve the conflict at the heart of the film. Vague epilogue notes state that Arjun fights future battles against Duryodhana, but doesn’t explicitly say, “To be continued.” If Arjun: The Warrior Prince wasn’t intended to spawn a sequel, then it needed a more definitive ending. The obvious selling point for Arjun is its animation. It’s gorgeous. The depth of detail in the terrain and buildings is astounding, a mark of Walt Disney Picture’s role as co-producer alongside UTV. During a scene in which Arjun’s home is set ablaze, the paint melts and drips from the walls. Arjun: The Warrior Prince is worth checking out for the sake of the animation alone, but consider switching it off before the hero starts slicing his enemies in two. This entry was posted in Reviews and tagged 2.5 Stars, 2012, Arjun, Arjun: The Warrior Prince, Ashok Bhantia, Bollywood, Disney, Hindi, Indian, Movie Review, Netflix, Sachin Kedhekar, The Warrior Prince, UTV, Yuddvir Bakolia on November 9, 2012 by Kathy. The Akshay Kumar action flick Rowdy Rathore is the only new Hindi movie opening in Chicago area theaters the weekend beginning June 1, 2012. Rowdy Rathore opens on Friday in four area theaters: Regal Gardens Stadium 1-6 in Skokie, Big Cinemas Golf Glen 5 in Niles, AMC South Barrington 30 in South Barrington, and Regal Cantera Stadium 17 in Warrenville. It has a runtime of 2 hrs. 19 min. Read my review of Rowdy Rathore here. Kumar’s star power clears all other Hindi films from local screens, including last week’s new releases Married 2 America and Arjun: The Warrior Prince. This shouldn’t come as a surprise as Arjun only managed to earn $5,527 total from ten U.S. theaters. I don’t have the box office numbers for Married 2 America, but I’d be surprised if it fared much better. Other Indian movies playing at the Golf Glen 5 this weekend include the Telugu films Adhinayakudu, Daruvu, and Gabbar Singh, as well as The King and the Commissioner (Malayalam). This entry was posted in Weekly Theater Updates and tagged 2012, Adhinayakudu, Akshay Kumar, AMC South Barrington 30, Arjun: The Warrior Prince, Big Cinemas Golf Glen 5, Bollywood, Chicago, Daruvu, Earnings, Friday, Gabbar Singh, Hindi, Indian, June 1, Malayalam, Married 2 America, Movie, Niles, Regal Cantera Stadium 17, Regal Gardens Stadium 1-6, Rowdy Rathore, Runtime, South Barrington, Telugu, The King and the Commissioner, Trailer, Warrenville on May 31, 2012 by Kathy. Two films make their debuts in Chicago area theaters the weekend beginning May 25, 2012. 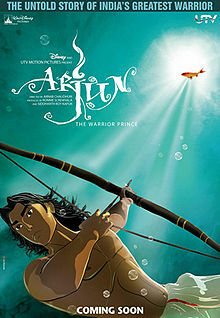 First up is Arjun: The Warrior Prince, an animated film co-produced by UTV and Disney. Arjun opens on Friday at the Big Cinemas Golf Glen 5 in Niles. The family friendly film has English subtitles and a runtime of 96 minutes. Also new in local theaters this weekend is Married 2 America, a thriller about an Indian-America woman whose husband goes missing while investigating a dam accident in India. The film released in Indian theaters on February 17. I suspect the success of Kahaani — which has a similar premise — prompted the eventual release of Married 2 America in the States. Married 2 America opens on Friday at the Golf Glen 5 and AMC South Barrington 30 in South Barrington. It has a runtime of 2 hrs. 30 min. Department carries over for a second week at both the Golf Glen 5 and South Barrington 30, which also holds over Vicky Donor for a sixth week. The Best Exotic Marigold Hotel — a British comedy set in India — expands nationwide this weekend. Other Indian movies playing at the Golf Glen 5 this weekend include the Telugu films Daruvu and Gabbar Singh and the Malayalam film Mallu Singh. The U.S. box office report for last weekend listed the total U.S. earnings for Grandmaster ($17,077) and Kalakalappu @ Masala Cafe ($30,949). Hate Story — which released in Indian theaters on March 18 but never opened in Chicago — debuts on Mela on May 25 as well. If you’d like to catch up on other films released earlier this year, the Bollywood rom-coms Tere Naal Love Ho Gaya and Ek Main Aur Ekk Tu are currently available for streaming on Netflix, as is the Tamil action film Vettai. This entry was posted in Weekly Theater Updates and tagged 2012, AMC South Barrington 30, Arjun: The Warrior Prince, Big Cinemas Golf Glen 5, Bollywood, Chicago, Daruvu, Department, Earnings, Ek Main Aur Ekk Tu, Friday, Gabbar Singh, Grandmaster, Hate Story, Hindi, Indian, Kahaani, Kalakalappu @ Masala Cafe, Malayalam, Mallu Singh, Married 2 America, May 25, Mela, Movie, Netflix, Niles, Runtime, South Barrington, Streaming, Tamil, Telugu, Tere Naal Love Ho Gaya, The Best Exotic Marigold Hotel, Trailer, Vettai, Vicky Donor on May 23, 2012 by Kathy.